After the lunching of Maruti A-star, India's largest car maker is gearing up for lunching its new car Maruti Ritz which will be available in market in the month of may in the current year. Maruti Ritz would be a small car which would compete with Hyundai i10, Tata nano etc. 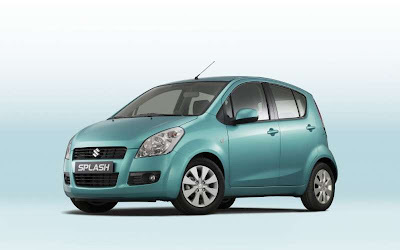 earlier, Ritz was named as Maruti Splash but due to some registration problem, Car maker has finally decided to change the name of the car. The car is likely to look like a cross between a Maruti Swift and the Alto. The most important fact would be the pricing in a segment that is full of cars from different makers. The price is likely to be between Rs 3.90 lakhs and Rs 4.30 lakhs in India car market. Maruti Ritz is powered by BS-IV engines and a 5-speed manual gearbox. Maruti Ritz will be equipped with 1.2L petrol engine and 1.3L multi-jet diesel engine. it is interesting to know that Ritz is 1.68 metres wider then Maruti Wagon R which belongs to the same family. The car is great example that showcase roomy interior, great functionality as well as configurable. A 1000cc, 65 bhp 3-cylinder and a 1200cc, 86 bhp 4-cylinder engine will power Suzuki's gasoline aspirations while the 1248cc, 75 bhp multi-jet engine manufactured at Manesar in India will complete the engine lineup. The car has incredible interior as its back seats is slightly higher then its front seats so that one can easily enjoy the view. There is LCD in the car which gives the driver additional information. It is expected that Ritz will be available in May 2009 with in 6 variants with two engine options. the car will be shine in 10 different colors, eight of which have a metallic finish and other two is developed by Suzuki specifically for the Ritz. The car is specially designed for urban, practical people with modern lifestyles. With the launching of Ritz, Maruti family includes 7 hatchbacks - 800, Alto, Zen Estilo, Wagon R, Swift, recently launched A-Star.